With its year-round mild climate and miles of ocean coastline, San Diego offers an array of romantic dining options. Countless restaurants feature striking city and ocean views. In addition to ambiance, many restaurants boast excellent seafood, French, and Italian specialties. Plan your next memorable evening with your loved one using the following suggestions for romantic restaurants in San Diego. San Diego features several restaurants offering gorgeous vistas. For views of the skyline, Coronado Bridge and San Diego Bay, dine at the atmospheric Bertrand at Mr. A's. Choose from seasonal French and Mediterranean dishes such as heirloom tomato salad, macaroni and cheese with black truffle, paella and rack of lamb. Indoor and patio dining are available. Reservations are encouraged. For views of ocean and city lights, reserve a table at Island Prime/C-Level. Resting on stilts next to San Diego Bay, Island Prime/C-Level boasts dishes created by revered local chef and owner, Deborah Scott. Try one of the signature cocktails, the popular diver scallops and cedar plank salmon. Dress code at both restaurants is business casual. 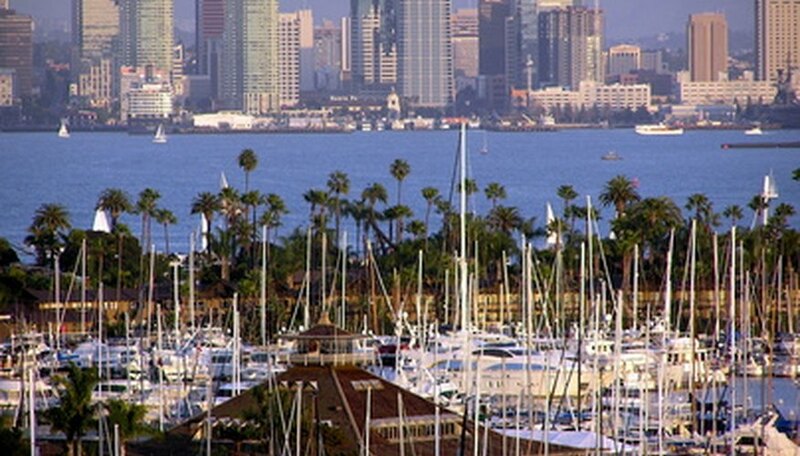 San Diego features several seafood restaurants situated next to the Pacific Ocean. Located in pristine La Jolla Cove against a backdrop of rocky cliffs, George's California Modern boasts dishes prepared with the freshest seasonal ingredients. Choose a chef signature cocktails, the award-winning carrot salad and one of many exotic seafood entrees. Reservations are encouraged. Or visit the Marine Room, a San Diego landmark since 1941. Maintaining its excellent reputation, the Marine Room recently won the "Most Romantic Restaurant Reader's Choice Award" from "San Diego Magazine." Watch waves pound the surf as you dine on the Ocean Trilogy appetizer or the famous blue crab cakes. For the entree, choose the macadamia crusted salmon or lilikoi pompano. Italian restaurants are perfect for romantic dinners because of their cozy atmosphere and delectable food. For a traditional trattoria meal, visit Piatti in La Jolla. Relax with your loved one next to the fire while enjoying a glass of wine from the extensive menu of domestic and international wines. Popular dishes include the scallops appetizer and lamb chop entree. Be sure to save room for the dreamy chocolate mousse. De Medici Restaurant in the famous Gaslamp District is perfect for anniversaries and special events. De Medici offers old world-style cooking such as award-winning sole portofino and 21-day aged steaks. Guests can enjoy dinner in the softly lit dining room or al fresco on the patio. French restaurants offer relaxing course meals for couples who want to linger over their food. For modern French cuisine, visit Mille Fleurs, an award-winning restaurant offering elegant and casual dining. Guests may sit in the formal dining room, courtyard patio or fountain room. The menu changes daily to ensure the freshest ingredients. Start with an appetizer of oysters followed by foie gras and veal sweet breads. Choose a beautiful pastry from the diverse dessert menu. Bleu Boheme serves country-style French cuisine in the charming North Park neighborhood. The menu serves traditional classics like the savory Boeuf Bourguignon and Coq au Vin. Don't miss out on the onion soup or the chocolate bomb for dessert. After dinner, take a stroll arm in arm to enjoy the neighborhood. Richardson, Mary. "Romantic Places to Eat in San Diego." Dating Tips - Match.com, https://datingtips.match.com/romantic-places-eat-san-diego-7879683.html. Accessed 19 April 2019.